In June 2016, OSHA investigators were notified of possible violations at a suburban NJ high school. Upon their initial inspection, contractors were found to be working in an unprotected 10-foot deep trench, which subsequently landed one of New York’s largest contractors in hot water. OSHA’s investigation found 9 violations including 1 willful violation against Landtek Group, Inc, who potentially face up to $198k in fines. Landtek was cited for the alleged willful violation of exposing workers to cave-in hazards – the site did not have proper cave-in protections or safeguards in place. 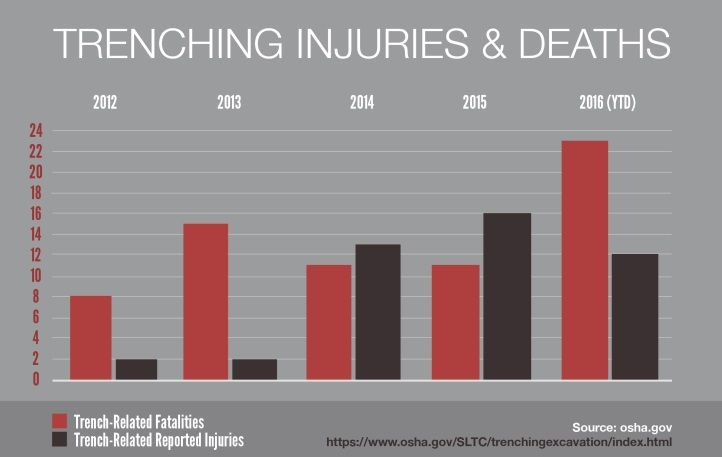 OSHA also found Landtek to have failed to prevent employee exposure to falls, provide mechanical retrieval equipment in the case of an emergency, have a competent person inspect the excavation, and to properly train employees on safely performing job duties and the hazards associated with them. At TSC Training Academy, we firmly believe that safety training is an investment in your future. Educate today for a safer tomorrow for you and your team.